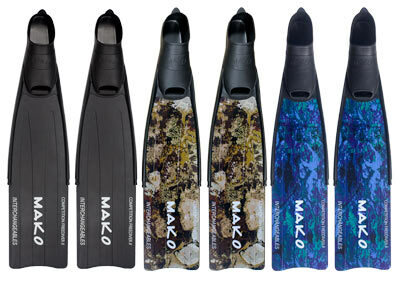 The MAKO BIG KAHUNA Fiberglass Fins are specifically designed for BIG GUYS who have BIG FEET! "I guarantee these fins and foot pockets to be the finest fins/foot pockets available. Before producing these fins, I met with several fin factories around the world. The factory I chose is the same factory that also makes fins and foot pockets for 2 of the most highly respected freedive gear companies in the world. It gives me great pleasure to offer such high quality fins. And because we sell direct to you the diver, we can do it for less." For more information on "MAKO DIRECT" pricing, click here. Are you a Big Guy with Big Feet? No worries. We have you covered. 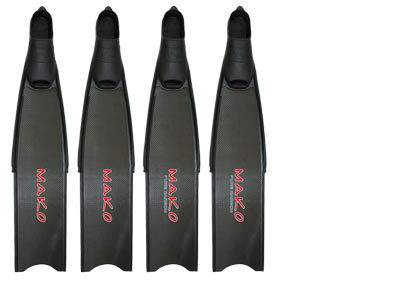 The MAKO Spearguns BIG KAHUNA Fins are specifically designed for BIG GUYS who have BIG FEET! We make the largest foot pockets available (size 14-15). 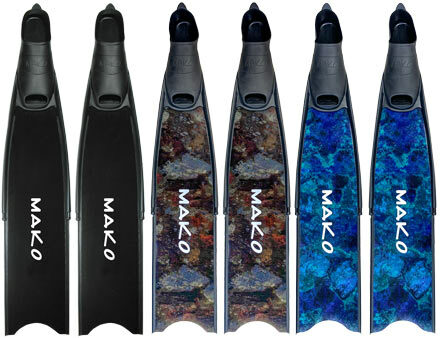 And, combined with our MAKO Spearguns South African Fiberglass Blades you can now have a high quality pair of fins at a very reasonable price. In addition to the larger size foot pockets, the blades are slightly wider, offering more balance and control and power for you big guys. NOTE: We also have BIG KAHUNA neoprene socks for you big guys! That's right - 3mm Neoprene Socks in size xxl (14-15)! In selecting the proper fiberglass and carbon fin stiffness, there are many variables to take into consideration such as a divers weight, divers strength, type of diving and conditions in which the diving will be done. The most standard method is selecting fin stiffness based on the diver's weight and strength. SOFT blades are recommended for small to medium size divers and are clearly the most popular. Larger divers who do not dive frequently also tend to like these softer blades. Note: Sold by the pair. If you ever loose a fin, MAKO Spearguns will sell just one fin. Being so heavily invested in unmatched customer service, we are one of the only companies that offer this. Being a big guy (6'5" / 270 lbs), it has been a real challenge to find comfortable find that could perform in a variety of environments. I found the perfect fins in the Big Kahuna model through Mako. Ordering was easy and straight forward. The product arrived on time and I have already used them four separate times. The fit is perfect and man do they perform! I highly recommend this product for any large guys with big feet.